Butoh Drawing is a continuation of our previous artistic and teaching developments in which drawing, painting, video and performance are tools for recognizing, isolating, and relaying shapes and patterns which are generated perceptually. This isolation is designed to reveal spatial relationships not dependent on linear scrutiny, but rather, moving through the perceptual field to understand collective creation. Traditionally, drawing and painting have conveyed images which refer to subjects such as allegories, portraits, landscapes, still lifes. As postmodern artists, we seek new definitions of drawing and painting which liberate the art spirit to convey traditional images as well as text, universal archetypes and the recording of the processes which venture outside the art world, into the communities and cultures which may create new archetypes, symbols and mythologies. Through the use of Butoh collaboration we wish to further investigate and use the visual focus and concentration necessary in producing definitions which generate new drawing and painting. Although Butoh has evolved as a dance form, we use its disciplines to reacquaint the individual with a strong awareness of the five senses, promoting a perception of a wider field. This fosters creative actions and formations of decisions and protocols which are artistic and contain a quality of economy proving more beneficial than those achieved through linear means alone. While we work together in our studio, we begin with exercises which emulate moving meditation. These exercises allow us to begin our Butoh Walk, which is a discipline or regimen of exercises leading to our state of visual focus and heightened sensory awareness of the peripheral field. It enables us to begin our unique from of Butoh Drawing. 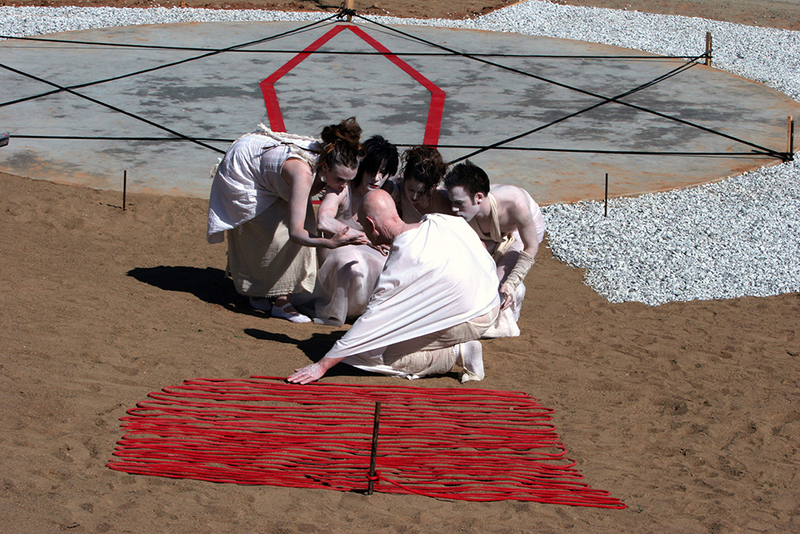 Butoh Drawing is inspired by the innovative works of such artists as Cezanne, Mondrian, and Bill Viola. John Cage challenged mid-century modernism by replacing aesthetic decisions with chance operations determining form. The history of Butoh Dance begins with Hijikata followed by Ohno and Kasai. In our individual work previous to Butoh Drawing, we each have experimented with the ingredients now affirmed by our studies with Akira Kasai and his protégé Setsuko Yamada. “Butoh, a Japanese indigenous dance form, is not only performance, but also the embodiment of one of the most precise critical spirits in the history of the consciousness of the body, with a strength of thought which impinges deeply on the history of the human spirit Butoh’s actual existence was the imprint left by the potent ideas of Tatsumi Hijikata. The understanding of the body in butoh makes it possible, through the body to give expression even to a flesh ravaged by age and illness, in what at first glance is apparently an enlargement and deepening of the concept of dance. When the style first appeared, Hijikata Tatsumi, himself called it Ankoku Butoh (Dance of Darkness). He founded Butoh with the collaboration of a small number of dancers and artists. Since then, Hijikata’s Theory of Butoh has had a comprehensive effect on contemporary arts in general” (Butoh in the Late 1980’s by Kazuko Kuniyoshi with translation by Richard Hart).